Phuket bar owner Panya “Sia Auan Bangla” Yingdang, extradited from Cambodia on Tuesda, has since confessed to masterminding last month’s murder of a former teen beauty queen and her partner in Chon Buri’s Sattahip district. 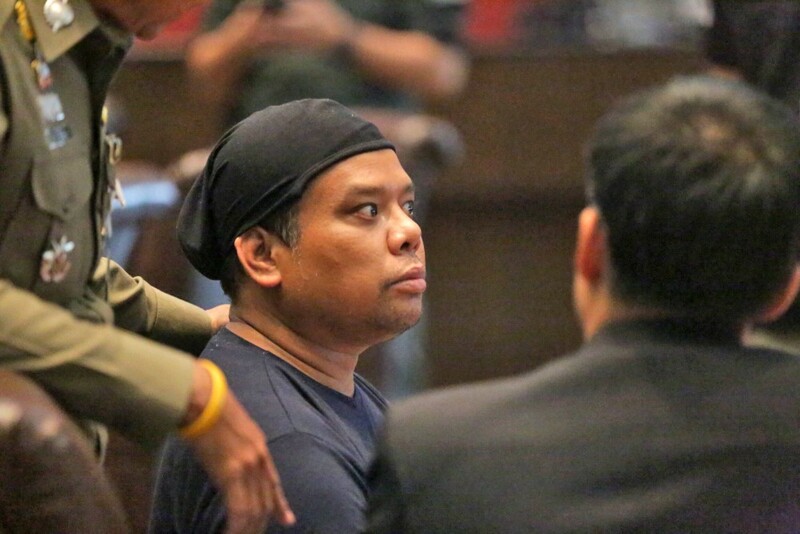 39 year old Panya, the final suspect to be captured in the case, also admitted to reporters while he was being escorted away to perform a crime re-enactment, that he had been spooked by Chakthip’s earlier public threat that he would be captured dead or alive. 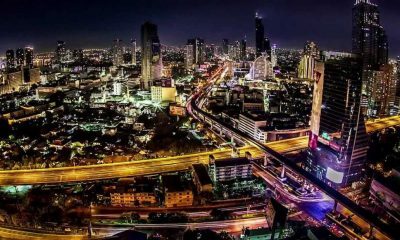 Chakthip had announced Panya could either keep running until he reached a dead-end and got arrested or face a possible extrajudicial killing. He said he chose the former and therefore fled to Cambodia. 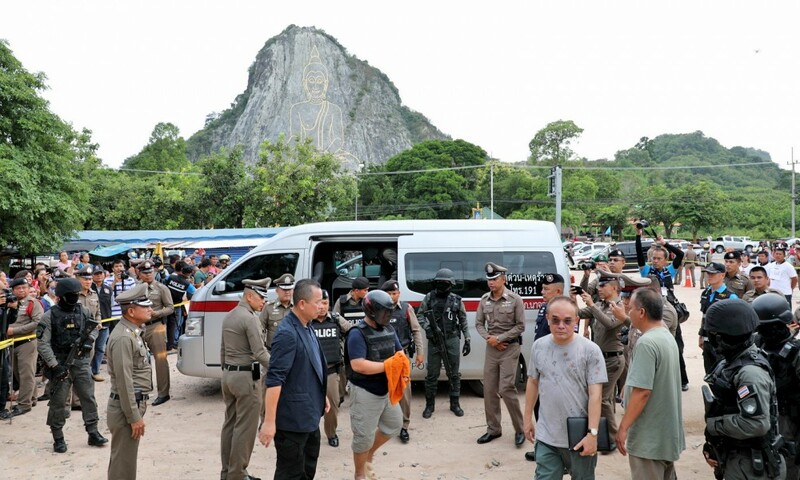 He didn’t realise until later that the killing had been committed in front of a sacred Buddha image carved into the cliff, Chakthip said. “When he knew about the Khao Chee Chan or “Buddha Mountain”, he was afraid of sacred things. 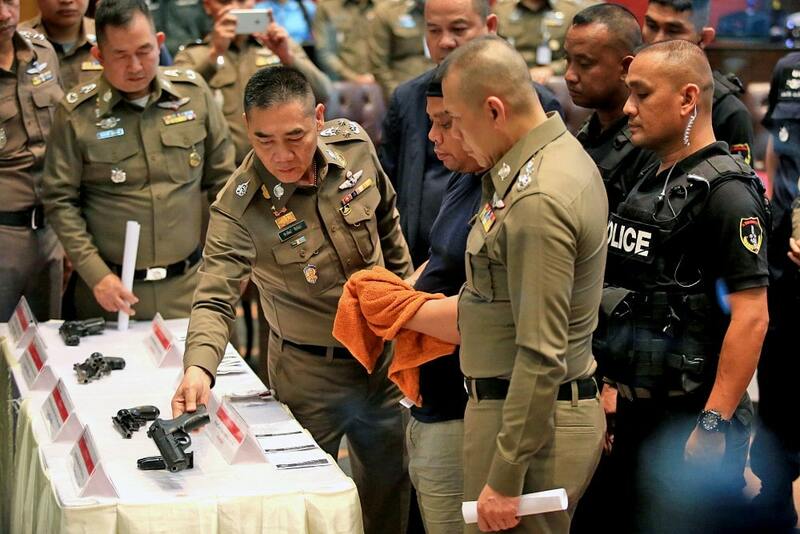 He said the gun wouldn’t fire the first 2 or 3 times he pulled the trigger,” Chakthip said, adding that Panya seemed to be in a normal state of mind, not suicidal. Chakthip said police would focus for the moment on prosecuting Panya for the Chon Buri killings and would decide later whether to reopen a previous murder case in Phuket that Panya had allegedly been involved but, according to social media speculation, paid 2 million baht to ‘buy his way out of trouble’. 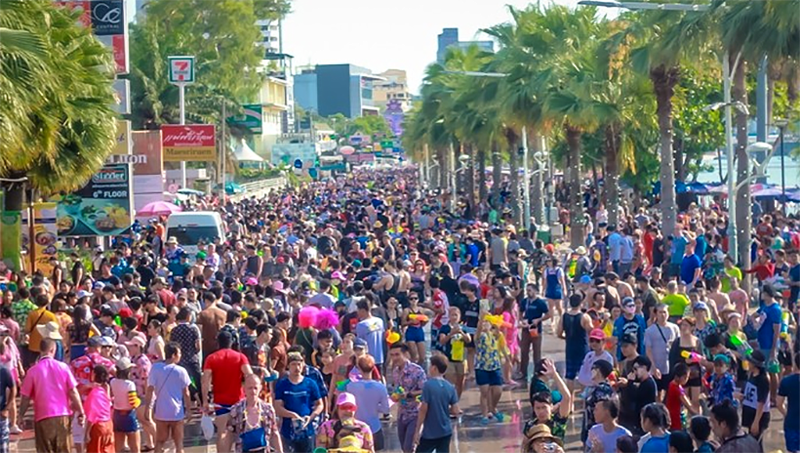 Panya was taken to perform the crime re-enactment at 3pm on Wednesday at five locations in Pattaya and Sattahip, including “Buddha Mountain” where about 30 people gathered to observe proceedings. Panya, wearing a bulletproof vest and a helmet while being guarded by more than 30 policemen and local administrators, asked for a brief moment to prostrate in front of the Buddha image, apparently to apologise for having offended at the spot. The two victims’ mothers were among those who watched the re-enactment from just 10 metres away. They said they were glad the police had finally arrested the man and hoped he would face the death punishment. Panya was detained overnight at Jomtien police station ahead of yesterday’s hearing at Pattaya Court for the first 12-day detention period. 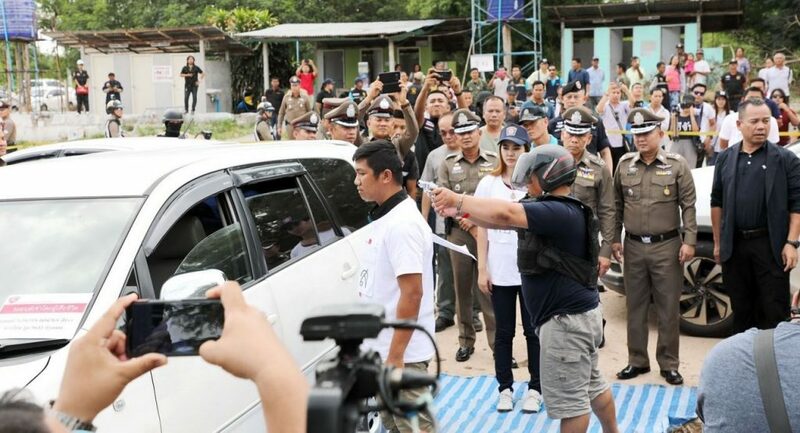 The court had issued arrest warrants for six suspects involved in the July 29 killing of 20 year old Paweena Namuangrak and her apparent boyfriend, 21 year old Anantachai Jaritrum, in broad daylight at Sattahip district’s Khao Chee Chan or “Buddha Mountain”. Panya allegedly masterminded the killing and shot Anantachai. The other suspects were another alleged shooter 22 year old Narong Warintharawet, who is accused of shooting Paweena; 22 year old Krissana Sisuk, who allegedly rented the house where the murder was plotted and spotted the victims; alleged spotters 34 year old Jeerasak Unaiban, 43 year old and Sayan Sisuk, and alleged getaway driver 35 year old Kiattisak Surangsaengoonmee. The six men directly involved in the killing, now all in custody, face charges of conspiracy to murder, carrying handguns and ammunition in public places and using them without permission. 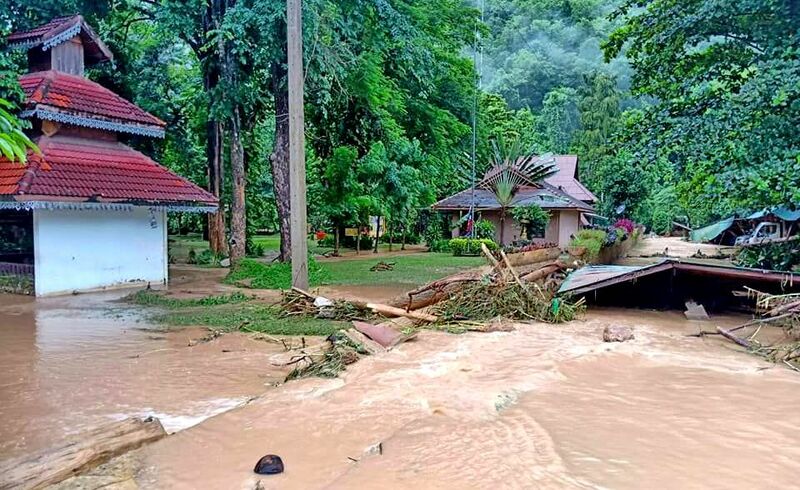 In addition, the police investigation also found that four other individuals – Niwet Yingdee, Kowan Silpano, Winai Silpano and Phuthorn Singdee – had helped Panya flee to Cambodia, so arrest warrants over a charge of aiding a fugitive to avoid arrest have been issued for them, police said. Those four men are already in police custody.